This incredible shield traces back to the end of 8th to mid 11th century, known as the Viking Age. The horses were symbols of power and were highly respected by the Vikings. Our model is embellished with a boss, and additional plates & painted horses. Diameter is 36". 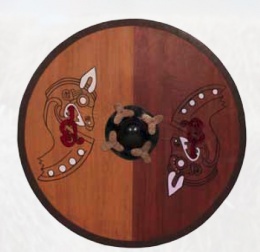 typical Viking shield in Gokstad style; Vikings often reinforced their shields with leather or, occasionally, iron around the rim. Round shields seem to have varied in size from around 45 – 120 cm (18" - 48") in diameter but the smaller and more manageable 75 – 90 cm (30" - 36") is by far the most common. The smaller shield sizes came from the pagan period for the Saxons. The late-9th-century skaldic poem, Ragnarsdrapa, describes some shields painted with mythological scenes. This page was last modified on 18 May 2014, at 19:08.